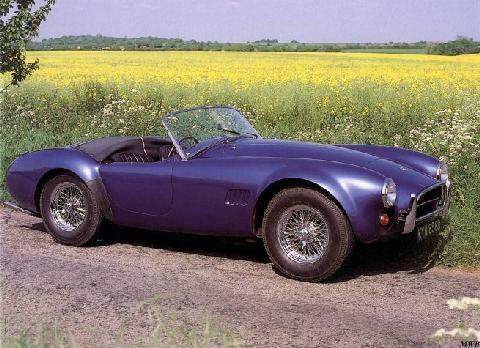 The MkIII chassis was designed by Bob Negstadt of Shelby-American and Allen Turner of AC; the basic layout of the old chassis was retained but the main tubes were larger and set further apart, and coil springs replaced the transverse leaf arrangement. Cars with 289 cu in (4.4 litre) engines were sold in Britain and Europe while America took the 427 with a 7-litre engine, and this version, with its bulging wheel arches, is the favourite with the dozens of outfits who have built sometimes poorly engineered copies. These cars had 390bhp and 475lb/ft of torque, which meant 0=60mph in 4.2 seconds and a top speed of 165 mph/265kmh. It should be said, however, that very, very few drivers were capable of getting the best out of them, and there was far too much power for the crude chassis. Variations on the theme included the Daytona coupes run by Dan Gurney in 1965, and a special works coupe styled by Allan Turner which ran, and crashed, at Le Mans in 1965.